Effective collaboration is considered a critical factor for success in school, work, and life. But how much time do we spend thinking about what makes effective collaboration and how it intersects with other concepts such as personalization and competition? As is the case with all Big Ideas there is a lot to learn by exploring the concept of collaboration. And what better what to explore collaboration than to embed it in a challenge? Essential Question: How do we build and sustain effective collaboration? Challenge: Solve a problem through collaboration! What is the difference between coordinating, cooperating and collaborating? Why is it hard to collaborate? 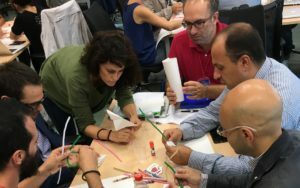 What is the role of collaboration in learning? What is the role of collaboration in the workplace? What is the role of the individual in collaboration? What is needed for successful collaboration? What is the role of technology in collaboration? Are collaboration and competition mutually exclusive? What does science tell us about collaboration? What does history tell us about collaboration? Can there be too much collaboration? Explore the definition of collaboration. Identify factors that inhibited collaboration.